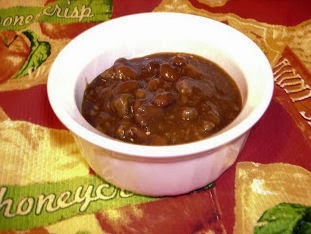 Every November I start getting in the mood for chili---Chili Cheese Fries, Frito Chili Pies, and Chili Burgers. Yum, yum, and yum. When purchased at a local drive-thru, chili burgers are generally anywhere from 600-700 calories.Yikes! My usual method of lowering drive-thru fare (cutting in halves) just isn't practical for chili burgers. Well, low and behold, I stumbled on to a delectable saucy turkey chili burger that is low is calories (246 per burger) and easy to cook. 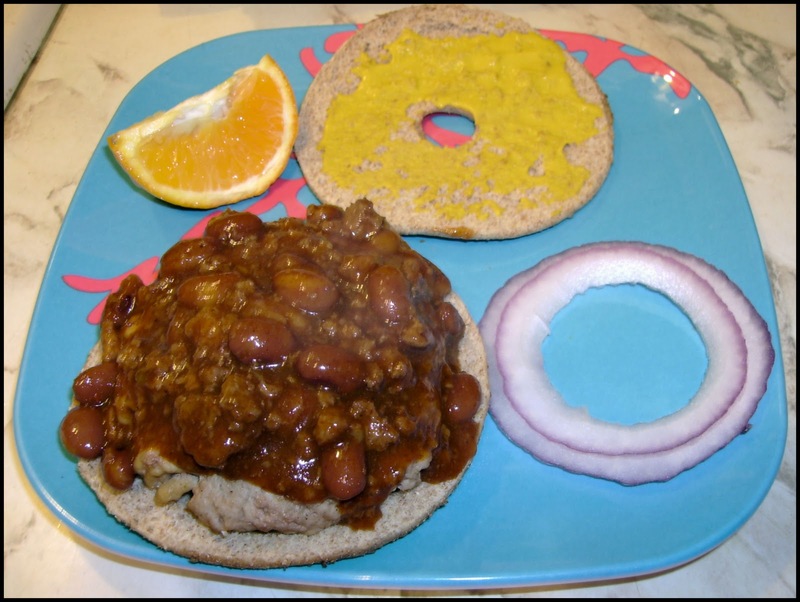 Saucy Turkey Chili Burger can be found in I Can't Believe it's Not Fattening! 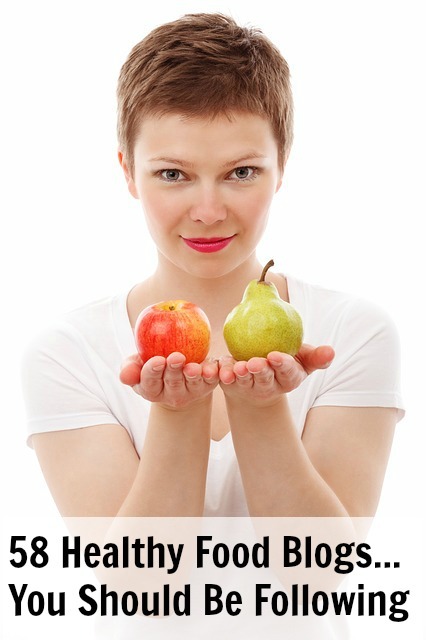 : Over 150 Ridiculously Easy Recipes for the Super Busy . Hands on time is 8 minutes. 1) Preheat a grill to high heat. 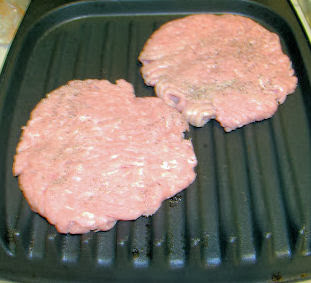 I am using the George Foreman Grill rather than an outdoor grill and doubling the recipe to make two burgers. 3) Line a flat work surface with waxed paper. With my hands, I shape the turkey into a tight ball. 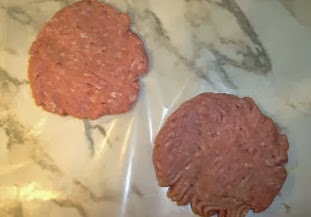 4) Place it on the waxed paper and press it into a 4-inch-diameter patty. Season the patty with salt and pepper. 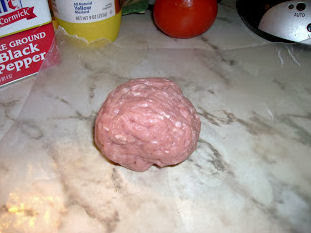 5) Grill until it is no longer pink inside, about two minutes per side. Since I am using the George Foreman grill, it takes approximately 8-10 minutes to grill. During the last minute of cooking, if desired, toast the bun by placing it, inside face down, on a top grill rack or away from direct flame until just toasted. 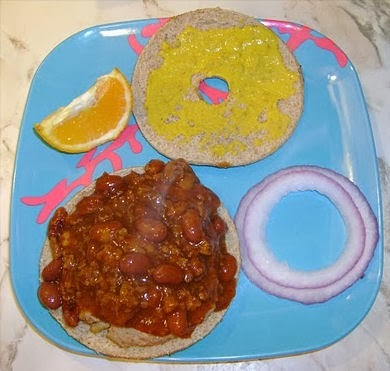 I replace buns with whole-wheat smart bagels which are only 100 calories per bagel. 6) Meanwhile, I microwave the chili on high in 30 second intervals until warmed through. 7) Place the bun (bagel) bottom on a serving plate. Add the burger, then spoon the chili on top. Spread the mustard over the inside of the bun (bagel) top. Add to the burger and serve immediately. If you want a truly stress-free cooking experience, this recipe is for you. Doubling the recipe is easy, so you can cook chili burgers to your heart's content. It is worth saying again. Yum.